1010 Mass is a high-rise building in Washington, D.C. The building rises 15 floors and 157 feet (48 m) in height. The building was designed by architectural firm Esocoff & Associates and was completed in 2007, making it one of the most recently constructed high-rises in the city. 110 East Washington Street is a high rise in Indianapolis, Indiana. It was completed in 1921 and has 15 floors. It is used for residential housing. The 1200 Landmark Center is a 255 ft (78 m), 15-story skyscraper at the corner of South 13th and Farnam Streets in Downtown Omaha, Nebraska, United States. 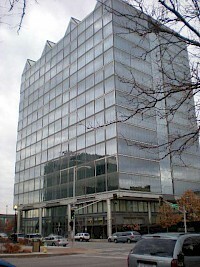 As of 2004, the building is home to the Omaha operations of Pacific Life. 26 Journal Square is a 179 ft (55 m) tall high rise in Jersey City, New Jersey. It was originally known as the Labor Bank Building. It was completed 1928 and has 15 floors. 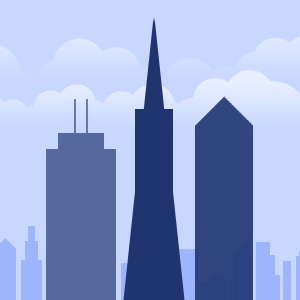 It is the 23rd tallest building in the city. It is often considered the first skyscraper in Jersey City. The Beaux Arts building was designed by John T. Rowland. It was put on the National Register of Historic Places in 1984. The Albuquerque Petroleum Building is a highrise office building located at 500 Marquette Avenue NW in downtown Albuquerque, New Mexico. It is 72 m (235 ft) tall and has 15 stories, making it Albuquerque's fourth tallest building. The top floor of the building was home to the Albuquerque Petroleum Club, a members-only restaurant which closed in 2007. The Albuquerque Petroleum Building was designed by Dwayne Lewis Architects and was completed in 1986. 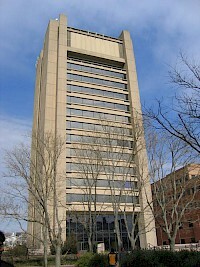 The Sciences Library, nicknamed the "SciLi", at Brown University is a high-rise building in Providence, Rhode Island built in 1971. At 180 feet (55 m), it is tied with One Citizens Plaza as the 13th-tallest building in the city. The building houses Brown University's primary on-campus collections for the physical sciences. Completed in the Brutalist architectural style, the building is Brown University's primary science library. Cadillac Place is an ornate high-rise class-A office complex in the New Center area of Detroit, Michigan constructed of limestone, granite, and marble. 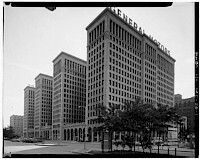 Originally the General Motors Building, it had housed the company's world headquarters from 1923 until 1996. In 1996, GM moved its world headquarters to the Renaissance Center and sold the magnificent building which is leased by the State of Michigan on a long term basis. The building was renamed Cadillac Place. 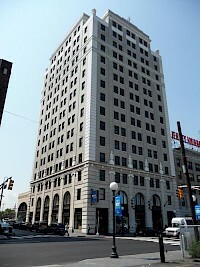 The Comerica Bank Building is an office building located at 101 North Washington Square, in downtown Lansing, Michigan. 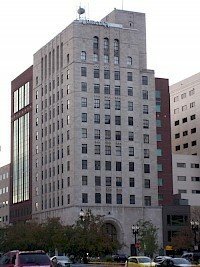 With 15 floors, it is the third tallest building in Lansing, after the Boji Tower and Grand Tower. The limestone art deco-style building was completed in 1931. Highfield House is a high-rise condominium in the Tuscany-Canterbury neighborhood of Baltimore, Maryland, United States. It was designed by Mies van der Rohe and completed in 1964. It was the second of two buildings designed by Mies in Baltimore. One Charles Center was the first. Highfield House was added to the National Register of Historic Places in 2007. Highfield House is a 15 story concrete tower facing east. Set on a platform, the main residential floors are 20 feet above the base.